Two electric, sensational quarterbacks defined both college and professional football in 2010. 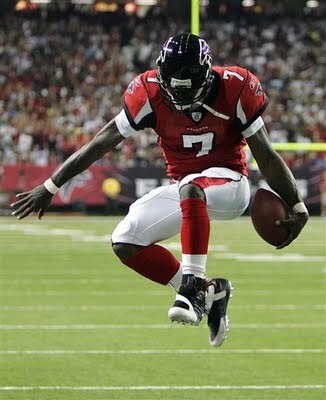 At the professional level, Michael Vick realized the unbelievable potential that he showed glimpses of at Virginia Tech and in Atlanta, taking the Philadelphia Eagles to first place in the NFC East. Meanwhile, Cam Newton had one of the greatest seasons in the history of college football, making Tim Tebow’s legendary 2007 campaign look like an off-year. He brought Auburn to the brink of a national championship birth and perhaps the school’s greatest season ever. Beyond their extraordinary performance on the field, the two quarterbacks share common baggage. Michael Vick was released from prison less than eighteen months ago for a conviction on heinous dog-fighting charges. Newton left Florida after being arrested for larceny and obstruction of justice charges after being caught with a stolen laptop computer. These athletes, for the moment, have found redemption on the current of their marvelous on-the field performances in 2010. Michael Vick, rated the most hated athlete in the world last year, rarely has his past deeds mentioned. The talk amongst broadcasters focuses on his touchdown-to-interception ratio, his spectacular runs, and his community service efforts to educate kids on the evils of dog-fighting. Vick has earned redemption in the eyes of the sports media. Meanwhile, for the balance of the season, commentators talked about how good of a kid Cam Newton is, how the laptop theft was more of a misunderstanding, and how he chose to leave Florida, rather than being pushed out the door for transgressions. Talk centered on Newton’s record setting numbers and hopes to open a child daycare program one day. Big numbers for Newton equated in forgiveness of past sins….until recently. The pendulum has swung against Newton over the past two weeks. After ESPN reports, alleging that Newton’s family attempted to negotiate an illegal pay-for-play deal with Mississippi St. for Cam’s letter of intent, the presumed Heisman winner has come under intense scrutiny. Then, FoxSports ran a story saying that Newton was caught cheating multiple times while at Florida. Now, media has either cast him as a victim of a pimping father or a “polarizing figure,” the most frequent term of condemnation used over the past week. The coverage of Newton and Vick demonstrates the nature of the world’s economy on forgiveness and redemption. In society, redemption always depends performance. When Newton lights up defenses, he is a misunderstood juvenile with hopes to care for young children. When rumors- however legitimate or baseless- stir about pay-for-play and academic dishonesty, he becomes a pariah. Newton likely has discovered the instability and failure of society’s model for redemption. When atonement depends on performance, one always stands condemned. There are moments of cleansing, but ultimately the judgment of the world hunts you down like a blitzing free safety. Redemption with any strings attached (whether it is through moral performance or worldly success) is utterly and entirely worthless, possessing no stability and no rest. Vick may have a clean slate right now, but as soon as his streak of success ends and a report surfaces accusing him of some shortcoming, the judgment of the media will drop the hammer on the Eagles star, in the same way the press has hounded and preyed on Newton. For the Cam Newton’s and Michael Vick’s of the world- all of us- there is good news. There is a place- one and only one place- where redemption and forgiveness is stable and permanent. That place is the Cross, where redemption is given freely without any consideration of performance, either good or bad. Jesus did the work on the Cross, and God deems us forever right, redeemed, and pure, independent of anything we do. The Cross is where forgiveness is never lost and never unstable- it sticks regardless of what happens on the field or what runs on ESPN. Thanks be to God that the Cross redeems even Auburn people. "Vick may have a clean slate right now, but as soon as his streak of success ends and a report surfaces accusing him of some shortcoming, the judgment of the media will drop the hammer on the Eagles star, in the same way the press has hounded and preyed on Newton. " So true. Redemption stories only get play in the media if the protagonist is in first place. Same thing happened with the baseball guy this past summer – the Texas Ranger pitcher. I'm not sure what that says, exactly. Maybe it's just that redemption all by itself isn't a headline-grabber. "The coverage of Newton and Vick demonstrates the nature of the world’s economy on forgiveness and redemption. In society, redemption always depends performance."